Tinplate racing car by Gnom Toys. 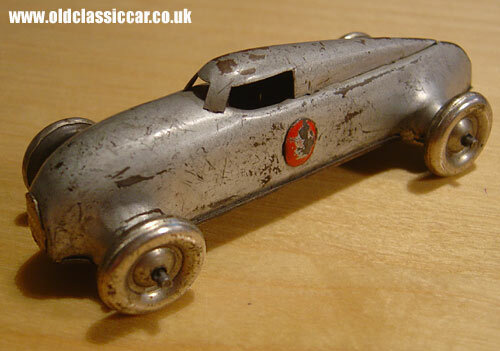 A metal toy racing car by Lehmann of Germany. 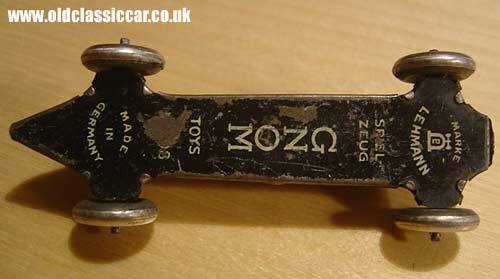 Measuring approximately 4 inches in length, this German toy racing / land speed record car probably dates to the 1930s. I've seen new reproduction examples of this tin toy for sale, both on eBay and in a Portuguese toy shop, but this is the original item. The underside is marked up with "Marke Lehmann - Spielzeug", the latter word being German for Toys. It is also marked up as Gnom Toys, Made in Germany. Were the "Gnom Toys" a particular set of toy cars from the Lehmann range, or perhaps a cheaper toy aimed at children with less to spend? The styling of this particular racer reminds me of the streamlined Auto-Union record cars of the 1930s.